Dorothy McAuliffe, the first lady of the Commonwealth, recently launched the Virginia Food Access Network (VFAN), an interactive tool to address issues of healthy food access throughout the Commonwealth. “Together, with the Commonwealth Council on Bridging the Nutritional Divide, we have worked to align our efforts to increase healthy food access, eliminate child hunger and accelerate the efforts of dedicated partners from across the state,” said First Lady McAuliffe said in a press release issued at a meeting of the Commonwealth Council on Bridging the Nutritional Divide. 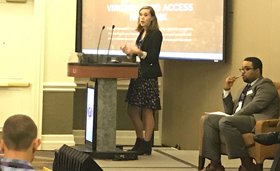 “Through the Virginia Food Access Network, there is now unprecedented access to the data and resources stakeholders need to identify gaps and maximize impact to better serve Virginians struggling with food access and hunger,” she added. The VFAN website is hosted by the Virginia Cooperative Extension Program. A large part of the site is a set of “story maps” that interface with an interactive map of the commonwealth to provide an easily accessible way to visualize data on food access. The story maps and interactive maps were developed on the Esri ArcGIS online platform at William & Mary’s Center for Geospatial Analysis. The final result is largely the work of Kaylin Stigall, a 2016 alumna and a CGA Fellow. Rob Rose, director of the CGA, met with the commonwealth’s chief technology officer and the discussion revealed that a project to take an assortment of data and use it to develop a cogent presentation was something that the Center for Geospatial Analysis does and does well. A story map, Stigall explained, is just like it sounds: a self-contained textual segment that is enriched by online technology. Stigall explained that a story map is an excellent medium, a format that is able to convey complex data simply to the layman as well as the wonk. Stigall explained the elements that make up her Childhood Hunger story map: On the left, there’s a side panel featuring the story title and photo, leading to the text. The main panel is a map of Virginia, with cities and counties outline. “That’s where all the fun stuff happens,” she said. The links in the narrative panel activate layers in the map. Clicking on a link Children who are food insecure (%) turns the Virginia map to a mosaic of magenta shades — the darker the shade, the higher the percentage. “So say you want to look at child food insecurity in James City County. It’s formatted in the story map so that when you check the link, the layer would appear over that county level,” Stigall explained. “What’s really cool about the online interactive component is that you get a popup that displays more information,” she added. Additional information adds context, such as the total enrollment numbers in popups related to data on free and subsidized school lunches. Stigall said the biggest challenge was figuring out the proper way to present information from 30 data sets to a public audience for whom data-map navigation is more opaque than intuitive. The VFAN web site was presented at a June meeting of the National Governors Association. Rose and Stigall were members of a panel, Collecting and Leveraging Data to Fight Child Hunger. Stigall says the site was received with enthusiasm by a number of teams representing various state administrations. “I think we inspired several state governments to think more seriously about incorporating geographic visualizations into their outreach and decision-making platforms,” she said.